Caravan was welcomed this weekend in Ljubljana (Slovenia) by Skala Fuskabo, Cirkokrog and Zavod Bufeto. Along the organisation of the Klovnbuf Festival, the seminar « Circus perspectives » was organized to bring together Slovenian actors from the field of youth circus. 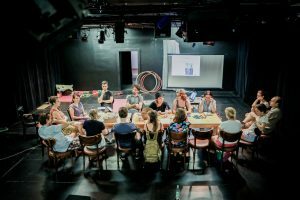 This small community is hoping to launch the first Slovenian umbrella of youth and social circus in order to develop the sector. Their first objective is to obtain a circus space to organise freely workshops and classes. Caravan facilitated a workshop enabling the participants to discuss their vision of youth and social circus as well as learning from examples of European cooperation, networking and research towards the professionalization of the sector. This seminar was a great occasion to understand the reality of circus for our partner, Skala; and hopefully will lead to further cooperation projects.